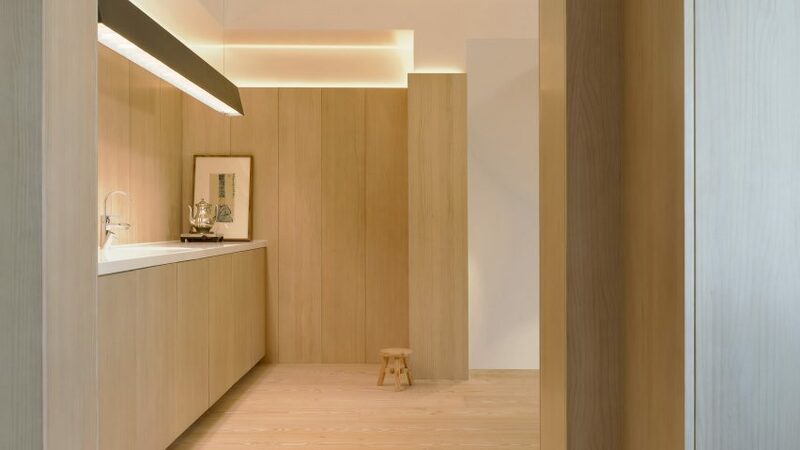 Timber panels line the walls of this Beijing house by Swedish studio Claesson Koivisto Rune, uniting different spaces, and contributing to a warm and soothing ambience. 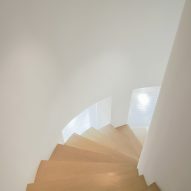 Claesson Koivisto Rune designed the interior for an existing house in the Chinese capital, called Xiang Jiang House. They chose to create a Scandinavian-inspired space that enlivens the mundane building. Pale wood used for the wall panelling matches the extra-wide floorboards throughout the house, and contributes to the relaxed, neutral feel of the interior. "Natural materials, the wood in particular, creates warmth and psychological wellbeing," claimed the architects. 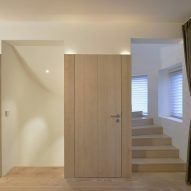 Recessed LED light strips incorporated along the top of the panelling creates a warm glow on the pale walls. A dimmer control can be used to alter the ambience within the house. 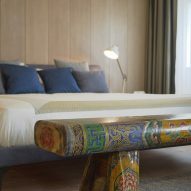 "The contemporary Scandinavian ambience is in contrast to the 'international-classical' exterior," said the studio, which also recently provided a 250-year-old hotel in Norway with a modern makeover. "With this contrast, the calm you meet when entering is unique: a completely ordinary house has been given an extraordinary interior." The first step taken by the architects was to simplify the internal floor plan. Next, they devised a method to lend consistency to the reorganised spaces, in the form of the timber panels lining the rooms. "A horizon line is established that runs through every room in the house," said the studio. "The door height determines the horizon level." "This classic horizon motif is architecturally calming and creates a powerful spatial flow that unites all of the interior." Furniture throughout the property is a mixture of classic designs and more contemporary pieces from Scandinavia, Italy, China and Japan. 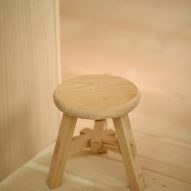 Offcuts from the flooring were used to built 60 small stools that are dotted around the house, along with the owners' collection of Chinese antiques. The rearranged floorplan promotes a family focused lifestyle. Large communal areas enable the family members and their guests to spend time together, while plenty of private spaces are also provided. "The entrance floor is particularly well suited for the entire family to congregate, or to entertain guests," said the architects. "But each floor above has its secondary living rooms for parents and children respectively." Among the communal areas are a lounge dominated by an oversized paper lantern designed by Edward Barber and Jay Osgerby, and a library featuring a swing-style seat and the extra-large conical pendant lamp designed by Claesson Koivisto Rune for Wästberg.